We’re proud of the work that we do, and we believe this is reflected in its quality. “Behind Brits on Pole is a very accomplished web outfit. It’s no good just having a news portal, you’ve got to get people to it, keep it current and write stories that people want to read. So what is it that sets Brits on Pole apart from the others? They don’t regurgitate stylized press releases, opting instead to talk directly to the subject and find a unique angle. 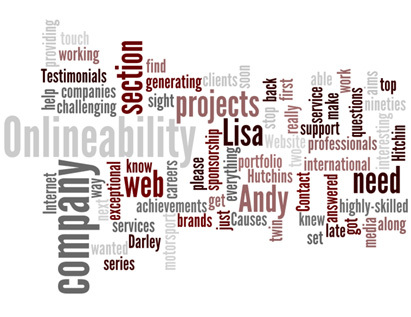 “We would like to thank Andy and Lisa for an abolutely fantastic new website. The work they have done is incredible and their service was second to none. We would strongly recommend Onlineability. You have proved to be a resourceful, adaptable, and highly supportive member of the team, combining a high level of communication skills with technical ability. Nowhere was this more valuable than during the recent [project], where you proved your worth time and again.